In the previous pAsuram, amudhanAr showed his state, that as emperumAnAr gave him the true knowledge, other types of knowledge would not be set in his mind; In this pAsuram – even though having taste/interest to get saved (from the material cycle), some are losing the best true knowledge, by ignoring this required aspect (love towards emperumAnAr’s divine feet), such are the people attached to worldly affairs – so amudhanAr feels sad. In the previous pAsuram – emperumAnAr removed the blemish in my mind, reformed it, and let true knowledge be born, and made me subservient to Sriya:pathi – would my mind go looking for someone else after this? (in previous pAsuram he actually mentioned that his mind would not be set in other false meanings; here it is mentioned that he said that his mind would not go after someone else; that is, going after someone else would itself imply that the mind set is in false meanings) – divined amudhanAr about the strength of his stability in this matter. So even though there is emperumAnAr, due to thinking that he is similar to them, they had left from him and were hoping against hope in their minds whether some other deity would save them, and they were in vain, and were uselessly having doubts/uncertainties in their minds and got ruined – seeing such state of them, amudhanAr feels sad. 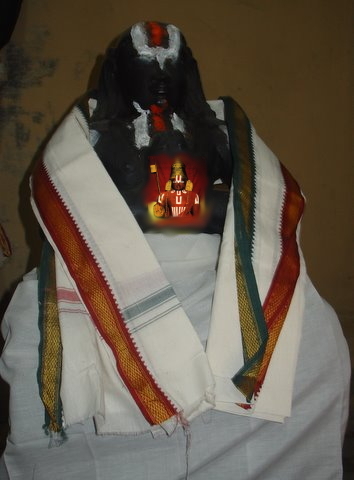 poyyai – the pure falsities of saying AthmA’s dhEha parimANathvam (AthmA is like body and does not have intellect) , kshaNikam gyAna rUpathvam (intellect/knowledge is transient (and knowing this gives him liberation, and if not knowing this then it gives samsAram)), jatathvam (AthmA is unintelligent), etc., and — brahmam’s mAyA SapaLitha-thva (brahmam is covered by mAyA; so, though brahmam is one, looking at reflection on bodies it thinks there are many Athmas (and those bodies are NOT real)), upAdhi miSrathvam (brahmam is one, and is reflected on bodies and appears to brahmam to be many AthmAs (and those bodies are real)), vikArithvam (brahmam undergoes changes), etc. aiyappadA niRpar – having doubts/uncertain minds. Oh! what bad state this is of them! – is the thought. By thamizh grammar, ingu yAdhenRu is written (as well as recited) as ingi yAdhEnRu; this is similar to ‘umakki yAn’. poyyaich churakkum poruLaith thuRandhu – poy – untrue. churakkum poruLai – production of more and more such falsities by those who reject or misinterpret vEdhas. As said in ‘asannEva bhavathi, asath brahmEthi vEdhachEth’ ( who understands brahmam as asath, he also become asath; he who understands brahmam as sath becomes that as well), that is thinking wrongly where knowledge that is absent, attaches wrong attributes, or mistakes for something else (agyAna, anyathA gyAna, viparItha gyAna). Or, (alternate meaning follows; please note the meaning in this part; a continuation of this alternate meaning is provided near the end for rest of the lines of pAsuram). to continue with the alternate meaning mentioned earlier, the meaning for ‘poruLaith thurandhu indha bhUthalaththE meyyaip purakkum’ shall be – emperumAnAr drove away one’s feeling of independence (from emperumAn), etc., using his advice, and in this world, he saved the AthmA who is sadhaika rUpa rUpan, and sathya Sabhdha vAchyan (identified by the word Truth). vaiyaththu uLLOr nal aRivu izhandhE – the sentient in this earth, have lost the most pure knowledge, and so our advice also ended without use; they got ruined as said in ‘samSayAthmA vinaSyathi’ (one always having doubts will be ruined), Oh!, and so since amudhnAr is a well-wisher of everyone, he is feeling sad for them, you see. As opposed to this, AthmA is eternal and does not change, and so is ‘mey’ (true) since it appears same ever. Oh the people of earth not knowing the path are suffering unnecessarily by not listening to the advice of emperumAnAr which can remove our dhEhAthmAbhimAnam and svAthanthriyam. Since they search for some god, it is clear that they Do wish to get saved; but considering emperumAnAr as just one among them, they are losing, even though they have got the ruchi (interest). emperumAnAr who can give proper knowledge is waiting; and there is no dearth of wanting (from the people); but without surrendering to emperumAnAr they are losing out such an opportunity – so amudhanAr feels sad. nammAzhvAr says He who gives this body is the god; amudhanAr says he who gives true knowledge and saves AthmA, is the god. This entry was posted in iyaRpA, rAmAnusa nURRanthAdhi and tagged amudhanar, deivam, dheivam, emperumanar, nallarivu, nurrandhadhi, nurranthadhi, nutrandhadhi, nutranthadhi, ramanujar, ramanusa on February 23, 2017 by raghuram.